Just think, 30 minutes dedicated to asking all those niggling questions that you’ve had sitting in the back of your mind for some time but just not got around to asking… NOW IS YOUR CHANCE! 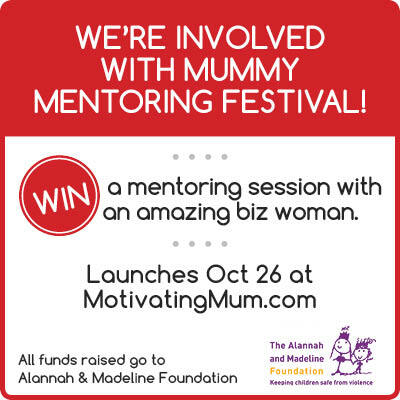 I am proud to be involved with Mummy Mentoring Festival – raising funds for Alannah & Madeleine Foundation. I have donated 3 sessions to help wonderful women, working from home, all across Australia. Check out this great charity event and how you can win a 30min phone session with me or any one of 37 mentors from all fields of expertise/business. BIDDING STARTS TOMORROW 26 October… go forth and win!